Wedding Kisses & Lifelong Wishes, the Wedding candle, is a celebratory mix of sweet pea, iris and vanilla. The perfect gift to celebrate that newlywed couple! You are going to be treated to a super fun and sensory experience, which is sure to make Coal and Canary among your favorite candles to burn! 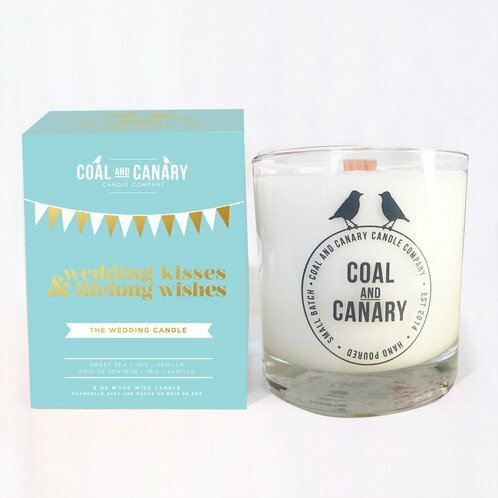 Coal and Canary candles are made with the highest quality soy blend wax and true to scent fragrance oils, which will fill your entire room with fragrance without becoming overpowering! You see that piece of wood coming out of the candle? That’s the wick! Pretty cool, right? Our wicks are made from organic and untreated wood, which will provide you with a unique burn experience and produce a soft crackling sound when lit, like your own little fire place!